Disclosure: I received this mug, complimentary, for the purpose of this post. All opinions are 100% my own. 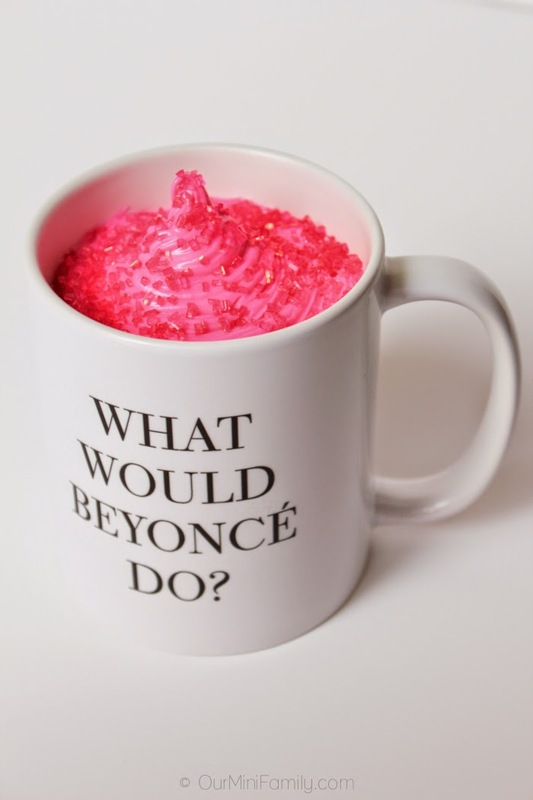 My very own "What Would Beyoncé Do?" Mug Cake! 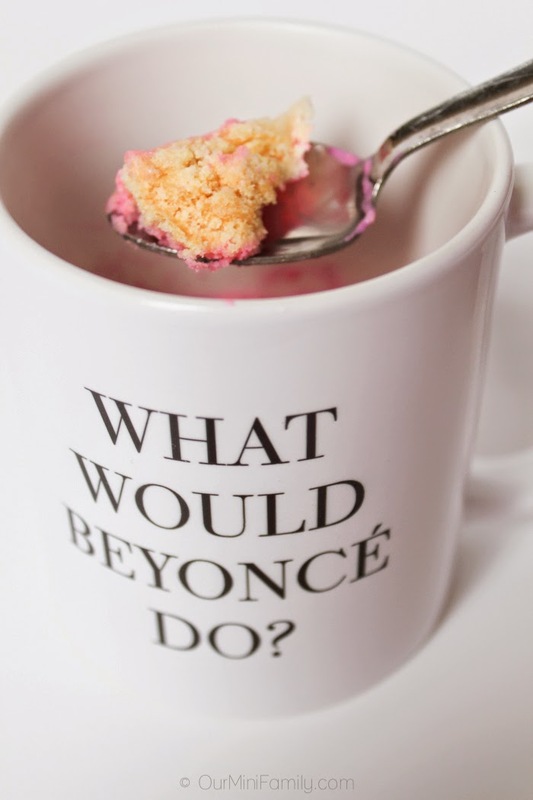 I know what you're thinking: "Cathy, I'm pretty sure Beyoncé didn't get to look the way she looks by eating cake out of a mug.." Well, I realize that--and when life gets tough and you've had a tiring day at work and don't have the resources/energy to bake an entire cake to put a little sunshine in your day, sometimes you just need a bite & to blast your favorite Beyoncé songs! 1. Drop your dry ingredients into your mug and blend. 2. Once blended, add your wet ingredients one by one slowly and stir with a fork as you add them. 3. Set aside your frosting room temperature to use after cake is done. 4. Let cake sit still with all ingredients (but frosting) for 1 minute to set in the mug you are going to bake it in. 5. Set your mug into the microwave. 6. Microwave on high for 5 minutes, but check in intervals to ensure it's baking evenly. 8. Take out of microwave and let sit for 2-3 minutes to cool if you're going to frost it (and so you don't burn your mouth because it *will* be boiling, lava hot). 9. Apply frosting as needed. This recipe was conceptualized and written by Cathy Mini of OurMiniFamily.com! And I know you're all wondering, "where on this God's green Earth can I get a mug of my very own?!" Well, you can buy this mug here! Exactly!! A cake all to yourself haha and thank you! Oh my goodness, that looks divine. I'm going to snag your recipe and try this myself. Thank you so much for sharing. I am not sharing mine with Beyonce either lol. Interesting. Not a big Beyonce fan. But, if that cup said Eric Clapton....hmmmmmm. Neet! I think the kid would love this! What a great mug! Will check out other cute products they have. Have to try out the cake too! Thanks for sharing the recipe! My pleasure--and yes, Charm and Gumption has very cute products! I love the mug!! The cake is super cute too. Glad you love it, Gabby! This is a super way to eat cake and not have the kiddio reaching for it! I love this idea of the cake in a cup. I will have to try this. Thanks for sharing. 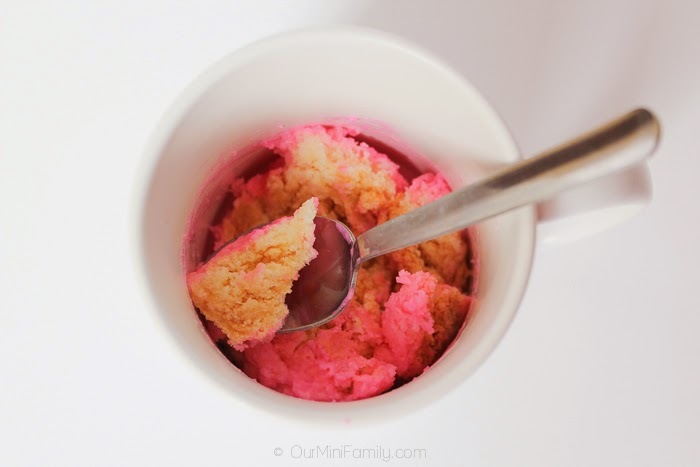 Being single and living alone I love the idea of cake in a mug! I mean lets face facts here--I do NOT need an entire cake in this apartment with me. But every once in a while I would love a little! That's a really good point--it's perfect if you're living on your own! First off LOVE the mug! Thanks for sharing the link! Second, I am totally smitten with this idea. Maybe even for a small gathering dessert and favor in one! I am pinning and saving to make on my own in 3.5 weeks after the wedding I am in. Thanks for sharing! Found you on Treasure Box Tuesday link party. Aww THANK YOU Jeannine! I saw you added me on G+, too! Added you back! You are SO FUN! What a creative way to sweeten you day! Haha thanks so much, hun! shout out to all the mug cake creatives! !